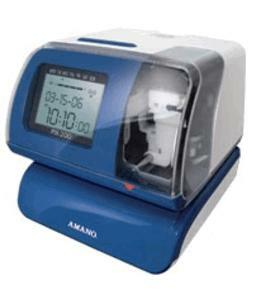 Amano PIX200 Signal Control Time Clock is an Electronic Time Clock that Time-Synchs with the Atomic Clock. The PIX200 works with a Side-Print style time card. Perfect for small business Time and Job Cost recording. Relay Kit is included for signals. Sync up your business with the atomic clock. Our PIX 200 Signal Control Amano time clock is an electronic time clock that is perfect for small business time and job cost recording efforts. A relay kit is included with the time clocks for signal relay. Equipped with a side-print style of time card, this clock does not total hours, but rather maintains accurate time via its sync with the Atomic Time Clock. With a wide range of options, these time clocks are a favorite with a number of different businesses. Easy to use, and available for a host of applications, the Amano PIX 200 is an ideal solution for your payroll issues.